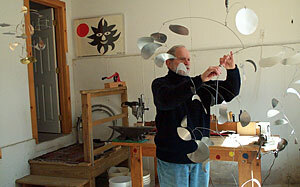 I began making mobiles in 1968 in Amman, Jordan, while stationed at the U.S. Embassy. I saw two films on Alexander Calder which the State Department had sent around to the more isolated diplomatic posts and I was entranced. So in my leisure time I took up making mobiles, at first with whatever materials were at hand: clothes hanger wire, tin can tops, and even yarn left over from my wife's rug-making. Then, seriously hooked, I bought some tools, aluminum sheet and spring steel wire. I continued to make mobiles at posts to which I was assigned, and gave three exhibits abroad -- in Jordan, Morocco and Belgium. In 1972, while on leave in the United States, I gave an exhibit in Fort Myers, Florida, and the owner of a gallery on nearby Sanibel Island offered to show my work. Later, while still in the Foreign Service, I gave exhibits in Germany and at the National Museum Art Gallery in Singapore. Eventually, in 1981, I left the Foreign Service to work full time on mobiles, and have since given half a dozen exhibits in this country. 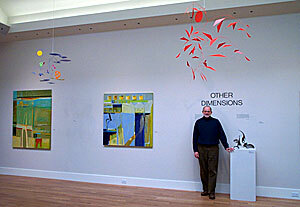 My work is currently shown in several galleries, including the Left Bank Galleries in Wellfleet and Orleans on Cape Cod, where the largest and most representative selection of my work is on exhibit. Anyone who makes mobiles owes a huge debt to Alexander Calder, who after all invented the art form. But I soon developed my own distinctive style and artistic vocabulary. I am especially interested in structure and in creating a piece that is well balanced esthetically from whatever angle you may see it -- with its three-dimensionality. And when you watch a mobile move in an air current, as it shifts and revolves, you add the fourth dimension, time. As with music and dance, it's a performance.